The brief of the project called for the creation of a Green Office Building for Spectral Services Consultants who have always played an important role in the advocacy of Green Buildings. The LEED certified Platinum Green Building has been designed as per features specified by U.S.G.B.C. The project proposes to superimpose harmoniously High technology and High craft in order to create a conducive microclimate for indoor activities and at the same time interaction of the interiors with surroundings in a synergetic way. The main Design Intention has been to achieve an unconventional Building Form to avoid a Box-Like structure imposed by the byelaws. 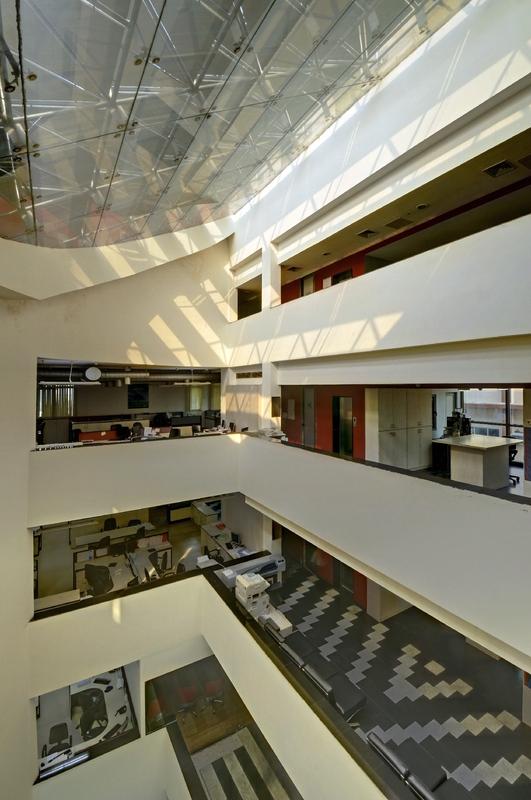 One of the most prominent features of the Building is that almost 85% of the interior spaces are day lit. 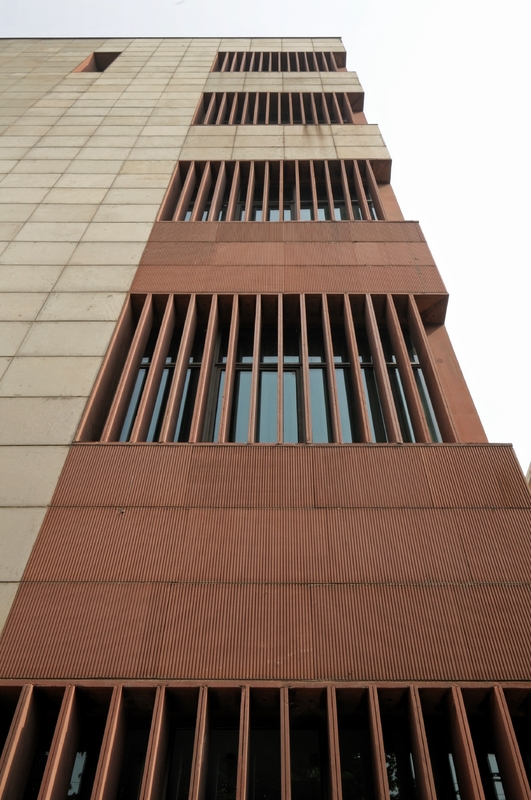 The vertical stone louvres have been effectively used to cut down the harsh sunlight from entering into the building especially from the N-W and S-W directions. These however allow the passage of wind. Re-use of Grey water for non-potable use, flusing, garden irrigation etc. Water Consumption Reduction by use of high efficiency fixtures, occupant sensors etc. Location : A-197, Sector 63, Noida, UP. Owner : Spectral Services Consultants Pvt. Ltd.
Architects : ABRD Architects Pvt. 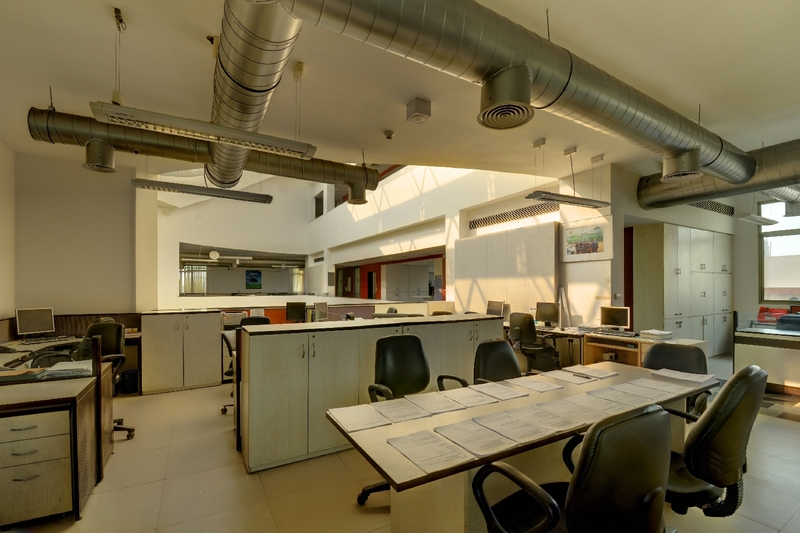 Ltd.
Programme : LEED Certified Platinum Green Office Building. Area : 1400 Sqm. Approx. 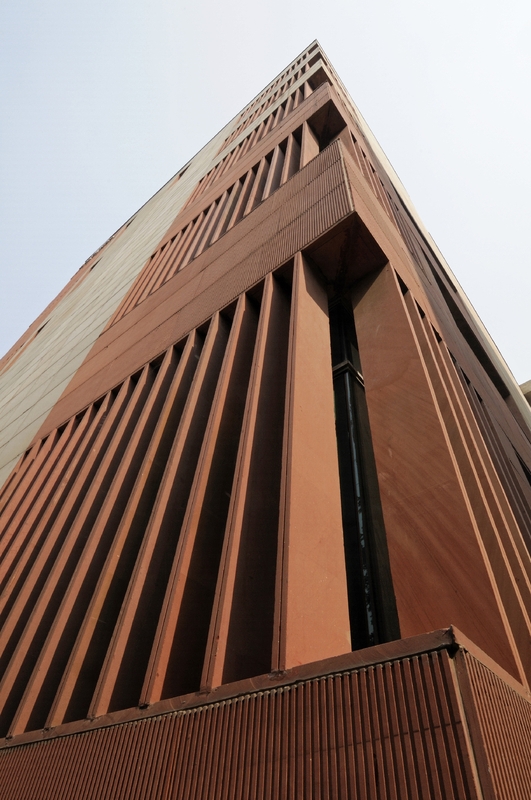 Materials : Structure: RCC and AAC Blocks, Cladding: Gwalior stone & Red Sand stone, aluminium door- Windows, Flooring: Vitrified Ceramic tiles, Granite, Carpet & Laminated Wooden Flooring. Contractor : ACIL Ahluwalia Contracts India (Pvt.) Ltd.
Construction : February 2006 to March 2007.